My Microsoft Exchange Server 2010 Inside Out book is slowly taking shape. Now that Microsoft has released SP1 (August 25, 2010), the code is finalized, which makes things much easier all round. Copy editing: Checking that the text flows, that there are no obvious grammatical errors; acronyms are explained when they are first used in the text; cross-references point to the right place in the text (such as figure references in the text); and that the author doesn’t ramble on about random topics or produce duplicate text. Formatting: The book has to fit into the format designed for the Microsoft Press “Inside Out” series. Figures may have to be moved to accommodate the flow of text elements and some special text elements such as sidebars have to be fitted into the pages. Book layout: Other elements such as the front and back matter (what you see on the front and back pages including illustrations and the ISBN information), the table of contents, and the index have to be generated. 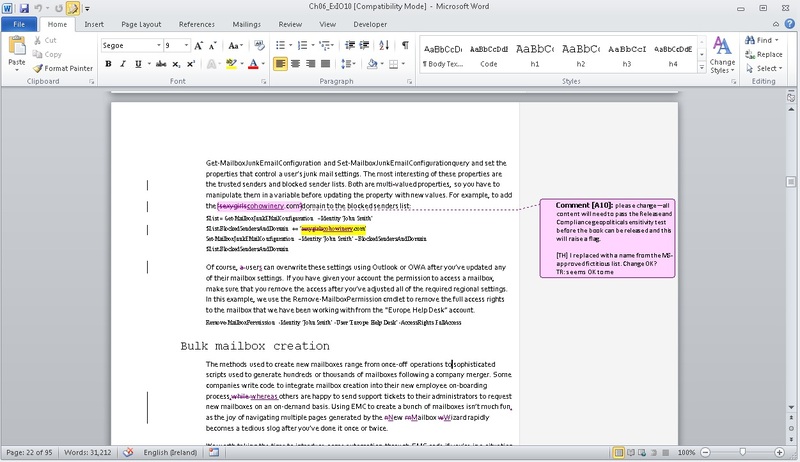 Technical editing: A technical editor has to validate that the text is accurate, that any references to web sites actually bring the reader to the correct information, that any code or other command examples (such as example PowerShell scripts) work, and that the author hasn’t forgotten to mention something important. Thankfully, I have a great technical editor in Paul Robichaux. Paul is both an extremely competent writer and a great technologist and he’s done a great job of keeping me focused and picking up minor but important errors in the text. Paul has documented his side of the story on his blog. Each chapter of the book goes from copy editor to technical editor to author and then back to copy editor/technical editor. The idea is that the author has to respond to queries raised by the copy and/or technical editors to generate final or corrected content. It’s at this time when I have a chance to update text to keep the book current with the latest SP1 builds (Microsoft has made several big changes to SP1 over the course of product development). Once updated, the chapters go back to the technical and copy editors to ensure that the author has addressed any concerns that were raised. Eventually we have final text that allows layout to be complete and the table of contents and indexes to be built. Indexes can take up to 5% of the total page count in a technical book, so they take time and a great deal of care to produce. When I wrote the original post in July, (see updates below to hear about current progress), I had seen and responded to queries in three out of seventeen chapters. At that time, I anticipated that the pace will quicken from here and that all of the chapters will be complete by the end of August or early September. Unfortunately, the pace didn’t keep up and we will not finish the technical editing pass until October 14, 2010. The original goal of having printed books released in late October or early November, just in time for the Exchange Connections conference in Las Vegas on November 1 will be missed. Amazon.com has just revised their publication date to December 1, 2010 (as of Oct 14) and whereas I sincerely hope to pull that date back a tad, the date is now firmly in the hands of the publication team. Update: 28 July – Fourth chapter (RBAC came back to me from the copy and technical editor today and has now been returned to Microsoft Press… progress all round). Update: 6 August – Chapters 5 and 6 (EMC/ECP and Managing Mailboxes) have now been processed. Six done, eleven still to do. Update: 24 August – Chapter 7 (The Store) done. Everything slowed down a little due to some vacation but we are back at full pace now. Update: 27 August – Chapter 8 (Exchange’s search for high availability). This was a humdinger of a chapter with the current page count at 101 (I’ll probably be under pressure to revise the page count downwards a tad). Thankfully Paul Robichaux, my esteemed technical editor, didn’t find too many errors and omissions to poke at, so the chapter has now been turned around and is in the hands of Microsoft Press for further processing. Update: 31 August – Chapter 9 (Backups and Restores). All done and back to Microsoft. Update: 1 September – Chapter 10 (Clients). 91 pages reviewed and sent back to Microsoft. Update: 7 September – Chapter 11 (Client Access Server). Another 71 pages reviewed and back to Microsoft. Update: 13 September – we are starting to see final pages generated in the form of PDF files. These pages have most of the layout set and are provided to the author as a final check before production commences. The graphics are not fully rendered in these pages but everything else is pretty final. I’ve seen chapters 1 to 5 so far. Update: 20 September – Chapter 12 (Mailbox Support Services – the Mailbox Replication Service and some other stuff) now returned to Microsoft Press (91 pages) plus chapters 6 & 7 set in final pages (some still requiring final tweaks, but looking good). Update: 25 September – Chapter 13 (Transport), another big chapter at 106 pages duly reviewed and sent back to Microsoft Press to be turned into set pages. Update: 27 September – Chapter 14 (Message Hygiene), a quick blast at 62 pages has now been processed. Only three chapters to go and over 80% of the book done (I think). Update: 3 October – Chapter 15 (Compliance). This is a heavyweight chapter because of the range of new compliance features incorporated in Exchange 2010 and enhanced in Exchange 2010 SP1. All 105 pages have now been checked and returned to Microsoft. In addition, I’ve now seen and checked final set pages through chapter 9, so we are really getting close to the point where we can declare success and look forward to final books. Update: 9 October – Chapter 16 (Transport and Journal rules). 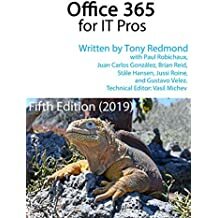 A short chapter at 45 pages but one that I think will provide value for many administrators because of the eight example transport rules that are described. Only one chapter to go and that’s a short one on the Toolbox so I think we are actually in good shape in terms of page count. The book is at 1175 pages now and the toolbox won’t be more than 20, so it looks as if we are going to be under the 1,300 limit that Microsoft Press has imposed. Maybe they’ll allow me to bring back the chapters that were cut? Update: 17 October – Chapter 17 (Toolbox). The last 43 pages has been submitted to Microsoft Press and all is well in the world. I can relax and take it easy… Or think about the revision for the next version of Exchange! 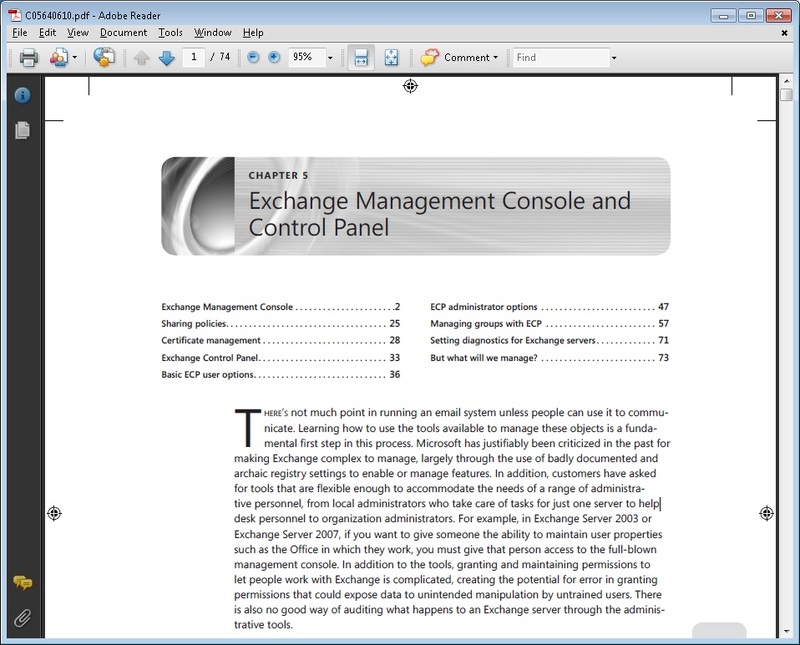 See Microsoft Exchange Server 2010 Inside Out for details about how to purchase the book from Amazon.com or Amazon.co.uk . This entry was posted in Exchange 2010, Technology, Writing and tagged book, Books, Exchange 2010, Exchange 2010 book, Exchange 2010 books, Exchange 2010 SP1, Exchange 2010 SP1 book, Exchange 2010 SP1 Inside Out. Bookmark the permalink.